A few weeks ago, science writer Carl Zimmer wrote (and literally bled in T. Ryan Gregory’s lab) a column in the New York Times exploring “junk” DNA. It’s a really good piece that also hits on how scientists have been arguing for a long time about what’s adaptive, what’s random, and just how to make sense of life (if there’s any to be made). He got to compare the total amount of DNA he had as a representative human genome to an onion. That’s 3.2 Billion base pairs– the units of DNA. Or 3200 mega-base pairs (Mb), with one megabase equal to 1 million basepairs. The onion has 5x as much DNA as a human. He notes in the story what scientists have observed after sequencing the human genome, about 1.2% of it codes for proteins. There are parts that code for RNA only too that play important roles too. So the question is, is the 98.8% that makes up the rest of the genome “junk” or is it important for some reason? “To subtract junk, meanwhile, would require swarms of proteins to chop out every single dead gene or transposable element — without chopping out an essential gene. A genome evolving away its junk would lose the race to sloppier genomes, which left more resources for fighting diseases or having children. It is a reasonable idea that having space in a genome to absorb mutations and transposable element insertions is important. It is akin to the hypothesis that Jupiter and The Moon shield Earth from overly heavy asteroid bombardment that may have prevented life from thriving/starting. With a bunch of junk DNA present, a genome has a place to absorb things that might have a negative impact on it’s function. And maintaining a lot of junk may not impose much of an energy cost to maintain. In the case of any genome, there are the non-coding parts of DNA that are “regulatory”. They are usually segments of DNA near genes that switch them on and off and determine the amount they are on or off. Some of the genome makes the RNA enzyme that makes proteins, the ribosome. Some DNA is in the “centromere”, the part of each chromosome that involved in ensuring proper segregation of chromosomes during cell division. At the ends of chromosomes are caps of DNA called telomeres that ensure the ends of linear chromosomes stay intact. Then there are introns. Sequences of DNA that interrupt the sequences that code for proteins and spliced out in the RNA produced upon gene activation. And as Zimmer notes, there are non-coding RNAs that regulate genes as well; usually acting to silence them. He notes one example of an RNA molecule called firre that tethers separate chromosomes together. firre suggests there may be a higher dimension framework in our cells to either turn genes on or off in various contexts. So is all that junk DNA truly doing something and we just aren’t aware of it yet as some scientists have suggested? In the story, He does note the massive genomes that exist, including several plants, the record holder being Paris japonica at 149 billion base pairs (149,000 Mb). That’s 50x the genome size of a human. But he doesn’t go the other way, asking the question about small genomes (that aren’t parasites). And that brings me to Utricularia gibba. It’s a weird plant, part of a group called bladderworts. U. gibba has a small, 82Mb genome with ~28,000 genes, on par with humans and other complex plants (1). And it is gene dense, with only 3% “junk” DNA. Just what led U. gibba to have so much complexity in such a small space? One hypothesis is selective pressure against a big genome. U. gibba has most of the same families of genes as other plants,but they tend to have fewer members in those families(2). The genome is pretty free of transposon insertions as well compared to other plants. This would seem to suggest that it is more susceptible to random mutation in an essential gene, it doesn’t have a buffer zone. There is evidence that some gene families have expanded in U. gibba, though that appears to be the exception, not the rule. In fact, the gene-gain rate as well as loss appears accelerated in U. gibba (2). What is the selective pressure that led to such a small genome? Bladderworts are carnivorous and in the case of U. gibba, aquatic, floating near the surface of water. The bladders that give it it’s common name are filled with air. The bladders can be triggered by a passing organism that trips some hairs on the bladder causing water to rush in via a suction mechanism, taking the prey with it into the bladder where it gets digested. Carnivory in plants isn’t that common. One reason it may evolve is in plants growing in nutrient poor conditions. They supplement their metabolism by preying on animals. These poor nutrient conditions also mean the plant needs to economize. One way of doing that is eliminating DNA, making replication and perhaps other processes more energy efficient. DNA does take nutrients to make: phosphorous, nitrogen, and carbon especially. 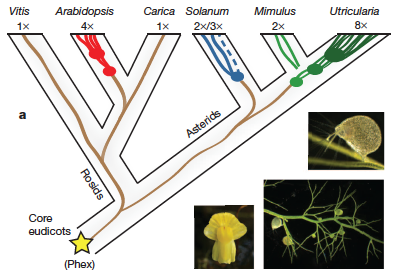 Utricularia does not form true roots either, more economizing. The bladder is a specialized leaf, and it’s flowers are a quite attractive yellow, they are related to (and resemble) snapdragons. The whole genome duplication history of some flowering plants, including U. gibba. The bladder, flower, and shoot system of U. gibba. From Ibarra-Laclette et al. Nature 498:94, 2013. Just how has U. gibba kept genes essential for life while eliminating so much DNA from its genome? Sequencing of the U. gibba genome and comparing it to other plants suggest one answer: ancient whole genome duplication. Plant evolution is full of whole genome duplications as an evolutionary force. Evidence suggests flowering plants arose as part of whole genome duplications. It allows genes to diversify and take on new functions while maintaining the old functions. In the case of U. gibba, there is evidence for two relatively recent whole genome duplication events followed by extensive gene loss and elimination of non-coding sequences. This is called genome fractionation. With several copies of everything, it is less likely that the loss of an essential gene will occur. Several can be lost, but as long as one is maintained, the population will carry on. And this appears to be what U. gibba has done, an extreme form of fractionation resulting in a lot of single-copy genes. U. gibba is amazing because it demonstrates that the junk in other genomes is not strictly necessary for complexity. It is hard to make blanket statements about genome evolution, as there are some events that affect one part of a genome and not others and each one is unique. Genomes are messy and studying them is not the most straight forward. But they have a lot of things to tell us about life on Earth as well as ourselves. U. gibba is amazing because it demonstrates that the junk in other genomes is not strictly necessary for complexity. 1. Enrique Ibarra-Laclette, Eric Lyons, Gustavo Hernández-Guzmán, Claudia Anahí Pérez-Torres, Lorenzo Carretero-Paulet, Tien-Hao Chang, Tianying Lan, Andreanna J. Welch, María Jazmín Abraham Juárez, June Simpson, Araceli Fernández-Cortés, Mario Arteaga-Vázquez, Elsa Góngora-Castillo, Gustavo Acevedo-Hernández, Stephan C. Schuster, Heinz Himmelbauer, André E. Minoche, Sen Xu, Michael Lynch, Araceli Oropeza-Aburto, Sergio Alan Cervantes-Pérez, María de Jesús Ortega-Estrada, Jacob Israel Cervantes-Luevano, Todd P. Michael, Todd Mockler, Douglas Bryant, Alfredo Herrera-Estrella, Victor A. Albert & Luis Herrera-Estrella. 2013. Architecture and evolution of a minute plant genome. Nature 498:94. 2. Lorenzo Carretero-Paulet, Pablo Librado, Tien-Hao Chang, Enrique Ibarra-Laclette, Luis Herrera-Estrella, Julio Rozas and Victor A. Albert. 2015. High Gene Family Turnover Rates and Gene Space Adaptation in the compact genome of the carnivorous plant Utricularia gibba. Mol. Bio. Evol. January, 2015.